It’s hard to imagine that the remote, unspoiled, untamed Sabi Sabi Private Game Reserve is in fact just an easy, 80-minute flight from Johannesburg’s OR Tambo International Airport (ORT). 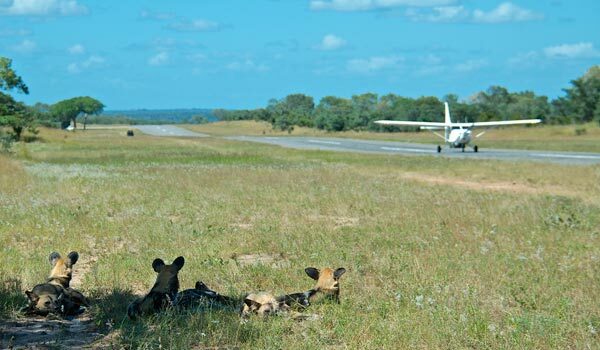 Guests leave the bustling city of Johannesburg behind, catch a convenient chartered flight and land directly on Sabi Sabi’s private airstrip in the heart of the African bush. There’s something thrilling about flying in low over the bushveld, perhaps glimpsing an elephant, zebra or kudu, and starting the safari experience immediately with a lodge transfer in an open safari vehicle. Flying in allows for an extra few hours of magical safari, enough time for a visit to the spa, another quick swim or simply some quality time soaking in the sights, smells and sounds of the bush. There are two flights daily to and from Sabi Sabi to accommodate international and local connections. Passengers gather at a private lounge facility at the Federal Air lounge (situated at OR Tambo), where they can enjoy light refreshments and relax before jetting off. Once at Sabi Sabi guests are greeted with a refreshing lemon-scented towel, a delicious cold refreshment and our famous warm welcome. Bags are efficiently whisked away, rangers are introduced and the African experience starts in earnest.